How to paint Blood Elf World of Warcraft. This digital painting video tutorial shows you how to paint female Blood Elf from World of Warcraft. I start from rough drawing to blocking in painting. You can scroll down below to see step by step images with instruction. This was made in early 2011. I am planning to paint over this one and take it to another level this year in 2016. Stay tune! I actually update the painting in 2016. 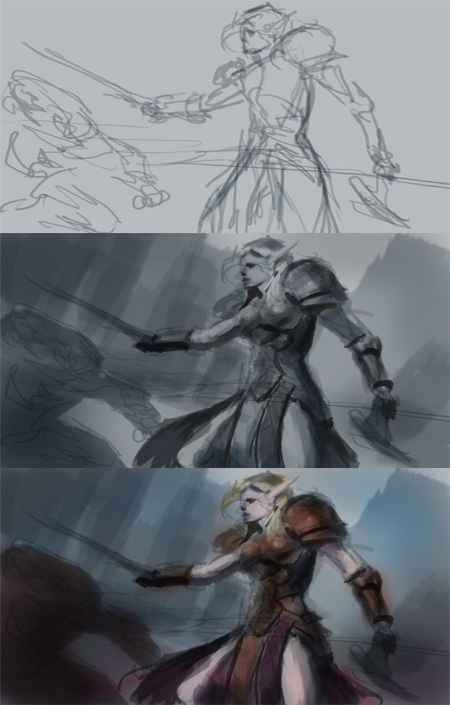 You can go to Blood elf character concept art tutorial for the next step. I thought it would be fun to branch out and paint some of the existing characters out there, here is another quick digital painting or color sketch tutorial. This time, I started out with constructional sketch line drawn to find her structure and suitable pose. After that I established shape or silhouette. During this process everything is still monochromatic and it is easier to try to figure out the lighting direction than when involving many colors. Once I figured out where the light source is coming from, I will paint or render basic value to overall painting. Try to look at the whole picture rather than focus on tiny little detail. Once I have the basic value in place or close, I will then start to slowly apply color and paint over the value sketch. This time I start off color a lot earlier than usual to switch it up. In this tutorial, I use Photoshop CS5 and Wacom tablet Intuo as a painting tool. It’s been a while since, I make a post on idrawgirls.com because I was busy creating the art community called ArtistsArena.org You should go check it out. If you are confusing with the when, what and how on custom brushes. I would say then you still don’t have to worry about using it. Try to get the basic foundation of shapes, value, and color down with just the basic default round hard and soft brushes. Once you get that down well, then you will have to learn how to create edges. Edges and custom brushes are highly related in painting. (I am talking about custom brush that mostly use in actual painting, not custom brushes that create leaves, grass, or patterns) The type of custom brush that confuse artists the most is probably the type that give us great painting texture. As for using custom brushes, do not worry so much about which brush I am using in the demo. Just focus on what kind of edges it will produces. That is pretty much all there is to it. There can be pretty much three types of edges from using your brushes, not more. Custom brush strokes can give you hard edge, soft edge and lost edge so you have to know how to utilize them. 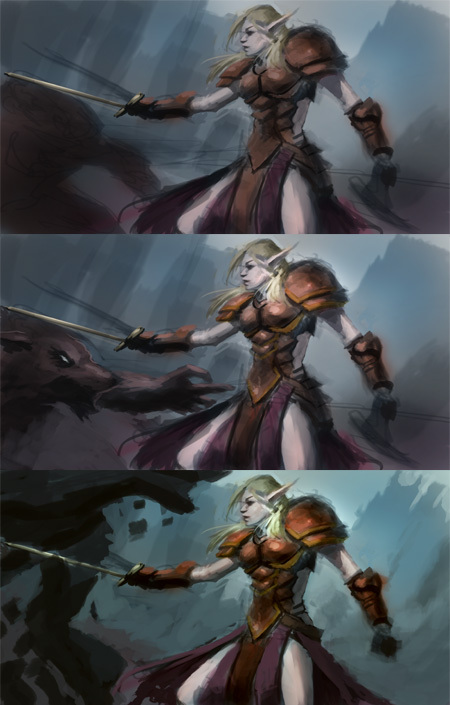 Here is the final Blood Elf speedpainting, approx an hour and twenty minutes. I might take it and refine it a little further when I have some more time. Check out Premium Video tutorials collection for slower and more intuitive. High Resolution (approx: 1280 x 750) HD Video Media files. Working with layers mode: Overlay, Multiply, Dodge, and Color. You can also browse around the blog by selecting thumbnail images on top or any topic on the right column. We have all kind of drawing and painting video demo tutorials range from basic, intermediate to advance for FREE to watch. A bit about our character from World of Warcraft, Blood Elf: Those now known as blood elves were once high elves. In the transition that led to this renaming, they glorified their civilization while discarding their honor. Life for the blood elves changed during the Third War, when King Arthas’ Scourge sacked Quel’Thalas and shattered the elven race. The Scourge slew more than 90% of the high elven population, devastating their culture. Prince Kael’thas Sunstrider was studying magic in Dalaran at the time of the disaster. He returned from his studies to find Quel’Thalas in ruins. Thirsting for vengeance, Kael’thas gathered the survivors and renamed them “blood elves” in honor of their fallen kin. Prior to the Sunwell destruction, all high elves were constantly bathed in its magical power. Now bereft of this arcane energy, the blood elves (and high elves) suffered from their withdrawals. Kael’thas claimed that they would soon die without another magical source to replace the Sunwell. The blood elves therefore set about learning to drain magic from alternative sources. 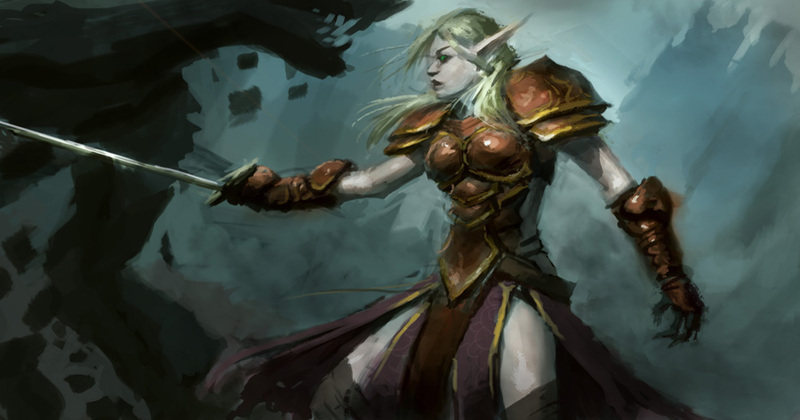 Below is Blood Elf digital painting video tutorial and step by step images. If you are interested in more of the same approach you can also go watch Diablo 3 Demon Hunter Digital painting tutorial and Dragon Age 2 digital painting video. For regular female figures and portraits tutorials you can check out values tonal study female figure, and more basic how to draw video and step by step go watch How to draw lesson girl face, How to draw person head basic. And digital painting tutorial rogue samurai female. As for the face or head (women, female) Draw girl’s face how to lesson video and step by step and learn how to draw face, woman. Enjoy the video tutorials. You have to be able to draw good and have solid foundation of black and white/lighting first. Just keep drawing a few hours everyday until you get the drawing down before get into painting. Dude I would love to see a color video on color theory. I would buy it in a heartbeat.